Two young men from Stranraer have been awarded the inaugural Fiona Colley trophy at the Springboard Charity’s 2016 Awards for Excellence. 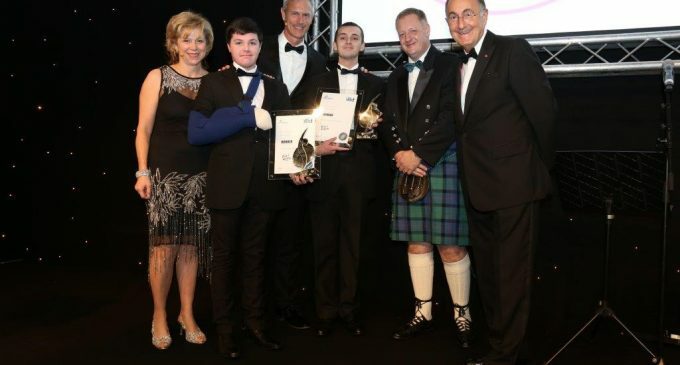 Connor Pomroy and Kai Palmer won the accolade which celebrates people from Scotland who have overcome adversity to complete a Springboard programme. Both winners completed the charity’s ten-week ‘Let’s Cook’ programme before moving on to undertake a course in Professional Cookery levels 1 and 2 at Dumfries and Galloway College. As part of the award, Connor (18) and Kai (17) receive a working scholarship to suit their individual aspirations and personal interests. The ceremony, held in London last week, was co-presented by Olympic and World Champion swimmer Mark Foster (pictured, centre).